Public school spending varies dramatically from one part of the country to another. New York is the biggest spender, doling out more than $20,000 per student each year, counting teacher salaries, support services and all the other costs associated with public schools. On the opposite end of the spectrum, Idaho and Utah spend only about one-third as much. The amount school districts spend is more a function of the money available than the actual costs of educating students, says Marguerite Roza, director of the Edunomics lab at Georgetown University. School districts will always spend just about all the money they’re allocated. Schools in areas more reliant on state funding than on local property taxes generally have fewer total dollars available to them, but there’s more equity across their districts. The largest spending spikes are found in districts serving regions with high-property values, Roza said. Wage and salary expenses are one area where there’s a particularly large variation across states. New York spends the most -- $8,712 per student -- followed by Connecticut and New Jersey. By comparison, states with fewer teachers and lower wages report spending as little as $3,000 per student in some cases. The influence of teachers’ unions may push wages higher in some states, as do favorable labor market conditions. Districts employing more experienced teachers or those with advanced degrees spend significantly more on salaries. Teacher pensions, health insurance, tuition reimbursement and other employee benefits add up to a sizable portion of school spending. Employee benefits for teachers account for about $1,700 in spending per pupil nationally and are as high as $4,127 per student in Alaska and $4,660 in New York. 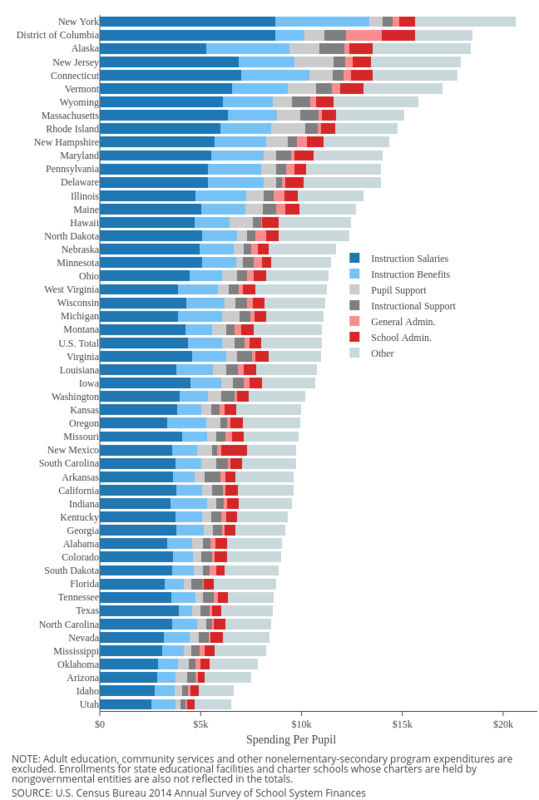 Of course, states with more generous retirement benefits tend to spend more. Pension expenditures, however, don’t fully register in states that underfund their retirement systems. As one would expect, the top overall spenders tend to be states with a higher cost of living. The Bureau of Economic Analysis calculates regional price parities, which measure prices of goods and services across states. This data suggests that costs are highest in the District of Columbia, Hawaii and New York. But not all states spending more on schools have higher overall living costs. Rhode Island and Wyoming have regional price parities below the national average, but still rank among the top 10 highest-spending states. Some states just have a lot more young residents. Consider Utah, where more than 1 in 5 residents is a public school student. With so many students, the state simply can’t afford to let average costs rise to the same level as in other states, says Mark Peterson of the state Board of Education. Areas with more rural districts tend to incur greater school transportation costs. Class size is another important factor in school district spending. The most recent federal data pegged average class size in Utah’s primary schools at nearly 28 students per nondepartmentalized class. By comparison, Maine, Tennessee, Vermont and Wyoming reported averages of fewer than 18 students per class. Comparable dissimilarities are found among high schools. Nevada’s departmentalized high school classes have an average of 31 students -- the largest size nationally and nearly twice as many as in some other states. While spending on school and executive administration accounts for a small slice of total spending (about 7 percent nationally), considerable variation exists across states. The District of Columbia and 13 states spend more than $1,000 per student on administrative costs. On the opposite end, Utah spends $463 and Arizona spends $450 per student. Part of this has to do with the fact that school districts are much more fragmented in the high-spending states, notably Illinois and New Jersey. As a percentage of total current spending, Massachusetts and New York spend the least on administration, while New Mexico spends the highest portion of its expenditures on administrative costs. A litany of policies that affect funding of school systems further drive up costs. States employ varying funding formulas and maintain mandates around special education or other requirements that end up affecting how much districts spend. States such as Arizona have seen extensive criticism of lawmakers for cuts to state school aid. Nationally, the most recent data suggests $11,009 is spent on public education per student. Amounts shown cover public elementary-secondary school systems and represent per pupil spending for fiscal year 2014.